Hello and welcome to our very exclusive wine club! We are honored to have you join our very limited release club with our hand picked selections. 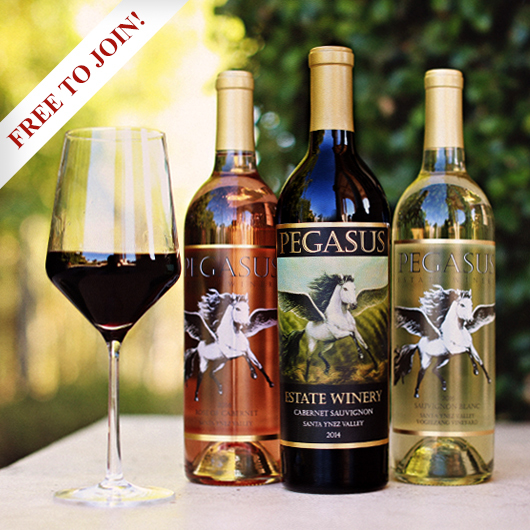 Club members will receive only 3 shipments per year of small lot production wines sourced by Pegasus Winery and crafted by master extraordinaire and renowned Winemaker Ken Brown. Our wine releases are truly hand-crafted and extremely limited and our club membership is also restricted to a maximum of only 100 with a wait list when our club is at capacity. First priority access to limited production wines. 20% percent discount on all additional wine purchases. Note: Wine purchases are limited, so no more than 6 bottles per customer due to quantity restrictions. Invitations to exclusive, members-only events, wine tastings, and winemaker dinners located offsite and at our beautiful Estate. First opportunity to purchase new and limited-release wines available only to wine club members prior to release for sale to the general public. Private tastings at the estate by appointment only and only to Wine Club Members and their guests.